US, 1930, 97 minutes, Black and white. Walter Huston, Una Merkel, Kay Hammond, Jason Robards Sr, Ian Keith. Abraham Lincoln was released in the same year as All Quiet on the Western Front. It was directed by veteran D.W. Griffith who had pioneered film-making in the first part of the 20th century and introduced the full-length feature film in 1915 with Birth of a Nation and in 1916 with Intolerance. He had a successful career during the subsequent years and the 1920s. However, with the coming of sound, his techniques were still in the silent style. This was Griffith’s second-last film. It is very reminiscent of a silent film despite the dialogue. It also includes some captions. However, there are some action sequences portraying the Civil War which indicate greater flexibility in camerawork and direction. 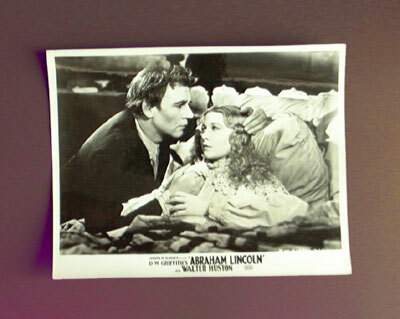 Walter Huston is credible as Abraham Lincoln although the film does not allow him to dramatise the role. At the beginning he is something of an icon – although, later, he is given the opportunity to speak, reflect and, in Ford’s theatre, recapitulate the Gettysberg Address. Una Merkel has a brief role as a rather histrionic Ann Rutledge. Kay Hammond is Mary Todd Lincoln – and indicates the harridan reputation that she had. The film begins almost with a series of silent tableaux indicating a prologue about slavery, the birth of Lincoln, his growing up, his initial work, politics. However, with his election as president, the film moves more into drama – his moving with his wife and family to Washington, the outbreak of the Civil War, the conduct of the war and his decisions. There are interesting sequences with a room full of telegraph machines giving information about the progress of the war. The film culminates with the assassination of Lincoln in Ford’s theatre by John Wilkes Booth. There is a final tribute showing the Lincoln Memorial in Washington. 1.A D.W. Griffith film? Interest in view of the career of the director? His silent film techniques? His captions and dialogue? His action sequences? The end of an era? 2.The status of Abraham Lincoln in American consciousness? The later portrayals of Lincoln by such actors as Henry Fonda and Raymond Massey? 3.The narrative of this film? The series of tableaux rather than dramatic developments? The stronger drama during Lincoln’s years as president? The action sequences of the Civil War? 4.The prologue, the indications about slavery? The theme of slavery throughout the film (and the background of accusations against D.W. Griffith for racism in Birth of a Nation)? The issue of the emancipation of the slaves, the visualising of the slaves, the slave ship? Lincoln’s contribution to the unifying of black and white in the United States? 5.The issue of the Union, the southern states and their rebellion? Lincoln and his advisers and the preservation of the Union above all? The achievement of this preservation despite the Civil War? 6.Lincoln’s origins, his birth in the hut? His growing up? His attraction towards Ann Rutledge, her illness and death? The big strong man, the fight, his drinking lying down from the barrel? A man’s man? His dignity? His work as a lawyer, his partner? Involvement in local politics, the speeches? 8.Lincoln and his politics, Republican, the Union? The rumblings in the south? The slave issue? The attack at Fort Sumpter? The Civil War? Lincoln and his stature, literal stature, top hat? Going into the telegraph room to get the information? His aides and secretary? The Secretary for War? The young men and their volunteering to go to war? 9.The initial victories, Bull Run? The further information about losses? His taking on command of the war himself? The generals? His meeting with Ulysses Grant, appointing him in charge? The film’s counterbalance with a scene of Lee and his attitude towards the war and to his men? 10.The ending of the war, the surrender? The victory in the north? The atmosphere of sedition still in the south? The issue of Jefferson Davis escaping? The rabblerousing and the urging of John Wilkes Booth to kill Lincoln? 11.The discussions in the White House, his re-election, Mary Todd and her preparing for the next four years? Going to the theatre, the enjoyment of the play, the topical jokes? Booth and his entering into the theatre, the death of Lincoln? 12.A tribute to Lincoln – in D.W. Griffith’s old cinematic style?